Jakarta Education Dept. is holding a teleconference this morning along with Education Sub-dept. heads in five cities and regencies.
" From the report through teleconference, those sub-dept. heads reported that the exam sheets have been arrived at 2.45 AM in five cities"
Jakarta Education Dept. 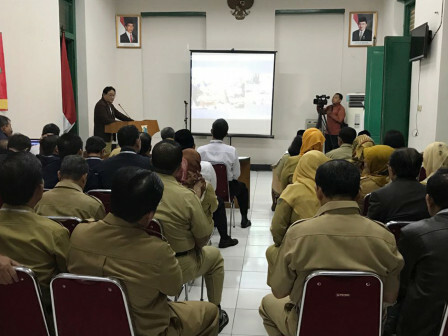 Head, Sopam Adrianto stated it is done to ensure the exam sheets have been distributed well to 2,991 schools that will hold the standardized national school examination (USMBN). "From the report through teleconference, those sub-dept. heads reported that the exam sheets have been arrived at 2.45 AM in five cities," he expressed, at the P2LPTK Office, Central Jakarta, Monday (4/30). Sopan also stated the exam sheets in Seribu Islands have been distributed in each school since Sunday (4/29). This year, the total number of the exam participants in the capital is reaching 150,824 people. "And it will take place from Wednesday to Friday this week," he said.